Sensortronics 65016W Double-Ended Beam, Stainless Steel, Welded-seal, IP67 Stainless steel and welded seal weighing applications. 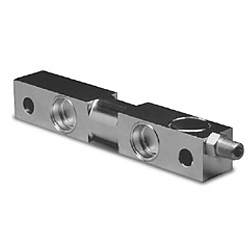 Designed for center loading compatibility with RL1600 tank weighing assemblies. Capacities from 1000 to 75,000 lb (453.6 to 34,019.4 kg). Integral 25'/7.6 m cable.